• Put a ball mark repair tool, two ball makers and tees into your pocket at the first tee. • Take the divot bottle that is on the cart, to your next shot so that you do not have to go back for it after the shot. • Carry a spare ball in your pocket so that you do not have to go back to your bag when you need to hit a provisional ball. • Take more than one club to your next shot. • If you are the cart driver, drop off your passenger at their ball before proceeding to your own ball. 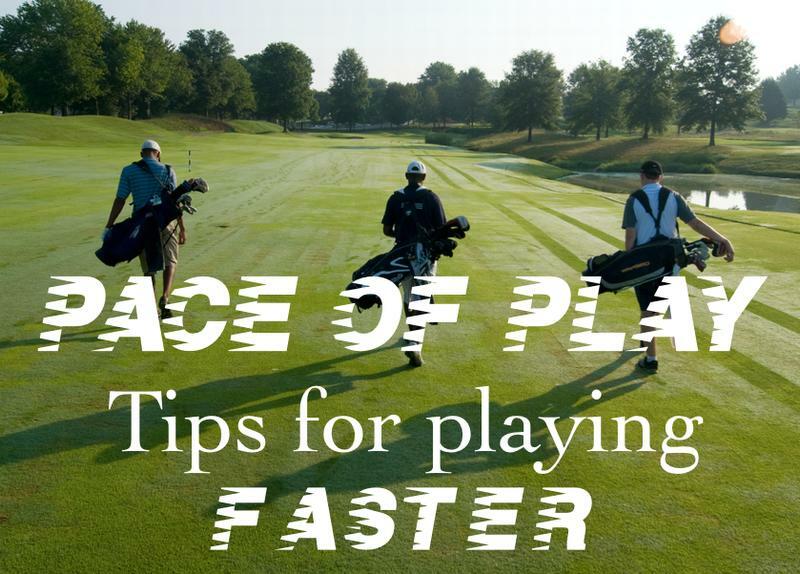 • If you are the passenger, take more than one club to your shot and proceed down the fairway after your shot. Do not wait for the driver to pick you up. • When in doubt hit a provisional ball. Eliminate the need to go back to where you hit your last shot. • If your next shot is with your pitching wedge or sand wedge, automatically take your putter with you. • Leave golf bags at a point beside the green that is en route to the next tee. • Park golf carts to the side or behind the green so that when you finish putting you will be moving away from the field of play and towards the next tee. • Study your line of putt while others are putting. • Continue putting until your ball is holed. • If you are the first in the cup, pick up the flag stick so that you can replace it after the last person has putted out. • Mark scorecards on the next tee box, not on or next to the putting green. • On par 3’s, players who cannot reach the green should hit when ready. • Always keep up with the group ahead of you.